When the odd occasion rises you cannot find your cat and not even imitating the sound of a tuna can opening helps, there is always… The box. 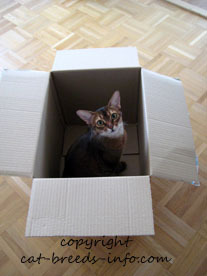 Mommy always says that even if you are in the middle of the Sahara, all you need is a cardboard box to find a cat. 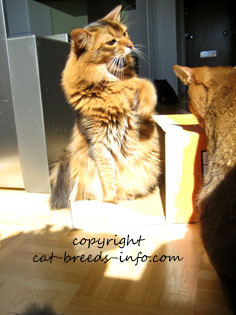 You put the box down, turn your back, wait three seconds and kazam! A cat is inevitably in the box. Well, I am not saying Mommy is wrong, but there is a deeper meaning to this whole box thing. You see a Cat needs to feel it is controlling its surroundings. You humans may not realize this because we are very discreet about the way we control your behavior. But the smaller the surroundings, the easier it is to control. 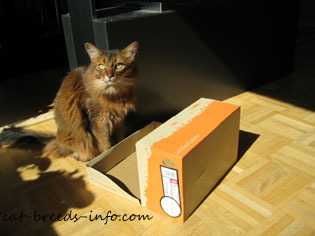 And so, the smallest possible environment – the box – brings the greatest feeling of satisfaction to a cat. When you get to the box first, it is yours. 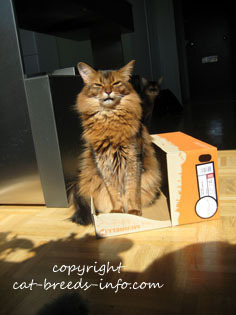 You are the King of the box. You rule. So, the first photo is Da Box. Empty. A good looking box with a lid. 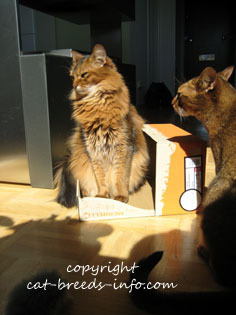 A lid always adds some value to a box as a cat can stalk under it and jump at any passer-by. Good surprise factor, the lid. Then, of course, I notice the box. Hard not to, really, as I was following Mommy as usual. 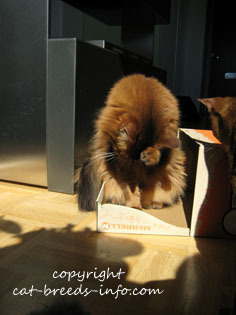 But a self-respecting cat needs to inspect the suitability of a given box. We are not that easy. 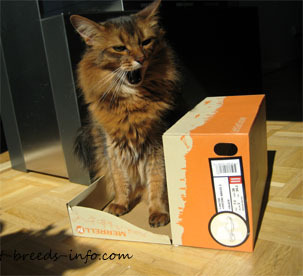 I decide I can still use the box, but instead of sitting inside it I sit on the lid (as no one took the trouble to turn it back right, ahem, cough cough... Hmmm.... No, Mommy does not take the hint) and show I am cool by yawning. There, a job well done. 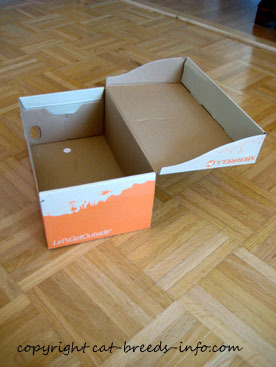 Time to wash my face – one cannot stress the importance of being tidy in a new box. And hey hey hey! What what what? Hippu! Get lost! This is MY box, I found it first! Not my fault if you don’t follow Mommy all the time like you should! Ooooo… The arrogance, the audacity! 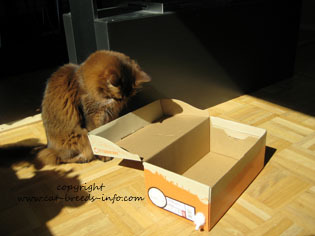 Hippu tries to challenge my ownership of the box Mommy gave me! But I am the greater cat. I will not continue a fight. I turn the other cheek. And victory! My outstanding moral fiber helped to win this battle. 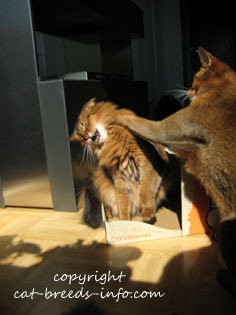 The box is mine!